MOSCOW, Russia -- The president elected by Ukraine on May 25 will not be fully legitimate, the speaker of Russia's lower house of parliament said in an interview broadcast on Wednesday. His remarks signaled that Moscow will continue to question the legitimacy of the pro-Western leadership in Kiev after the election, although President Vladimir Putin has said holding the ballot will be a "step in the right direction." 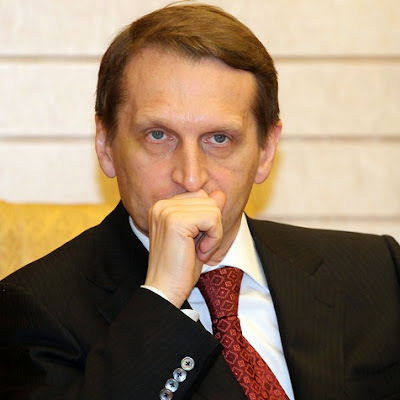 "We consider the current Ukrainian regime illegitimate," Sergei Naryshkin, a Putin ally who is chairman of the State Duma lower house, told state-controlled Rossiya-24 television. "Of course, the degree of legitimacy of the regime or the president elected on May 25 if the election takes place, in my opinion, will not be full," he said. On Sunday, the regions of Donetsk and Luhansk in eastern Ukraine voted for self-rule, deepening a crisis since President Viktor Yanukovich turned his back on a trade deal with European Union last November. Yanukovich was ousted by parliament after he fled Kiev in February. "I deeply believe that the crisis in Ukraine has gone too far... Still, there is a possibility of stemming this crisis, of limiting the escalation of the conflict," Naryshkin said.